Ethnicity estimates: a marketing tool that ends up making people question the whole thing. We’ve mentioned the ethnicity results before here. For the most part, my view is that they are entertainment except in situations where a parent or grandparent is totally unknown (and then the estimates are only a broad clue). The ethnicity estimates are based on samples and assumptions which makes them guesswork from the start. Calling the estimates “science” doesn’t change that, but the use of that word suggests they are wrapped in a cover of accuracy that is more of a foggy damp cloud. 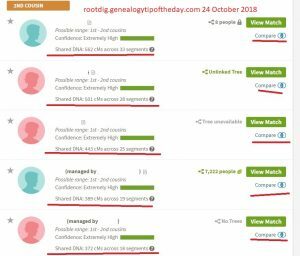 AncestryDNA recently announced a “launch” of their Irish DNA regions. Being one-eighth Irish, I was curious about the results. I’m no longer curious, but I am just as uninformed a I was. I’ve decided that game is no longer fun. It is beneficial to know about migrations and political boundaries. It also is a better use of my time to apply that information to my research than to sit and figure out “how Ancestry” got these ethnicities. My time spent with my DNA results is best used in analyzing the matches I have, the shared matches, etc. The science behind that is entirely different than the science that says “You’re 50% German, get out the lederhousen.” The cousin relationships are what matters, not the ethnicity estimates.